A European team of scientists has discovered how the cells produce tiny pieces of RNA – called piRNA – that identify and silence ‘jumping genes’ or transposons: genes that are able to change their position within the genome and therefore alter or disrupt the genetic code. Comprising just 30 letters of genetic code, piRNA are only found within cells in the reproductive organs of animals, where ensuring the stability and integrity of DNA is of particularly vital importance. They bond to proteins called PIWI and guide them to the messenger RNA produced by the jumping genes, which the PIWI protein then destroys. They are also able to guide PIWI proteins to the jumping gene in the nucleus, which the PIWI protein silences, preventing it from creating more jumping gene RNA. Although piRNAs have been known about for many years, scientists have until now had very little understanding of exactly how the piRNAs that guide PIWI proteins to jumping genes in the nucleus are produced. The research, which involved groups from EMBL Grenoble and CEA-Grenoble, tracked the action of piRNA by inserting an artificial ‘jumping gene’ into a fruit fly germ cell. The scientists were able to see the piRNA bind to a jumping gene messenger RNA in the cell’s cytoplasm and to the PIWI protein, which then cut the first section from the jumping gene mRNA to silence it. But destroying the jumping gene mRNA was only the start of the process, as the team discovered. The PIWI protein and piRNA then continued to work their way along the jumping gene – in a process dubbed ‘inchworming’ by the researchers – cutting off 30 letters of code at a time and converting these into new piRNAs. 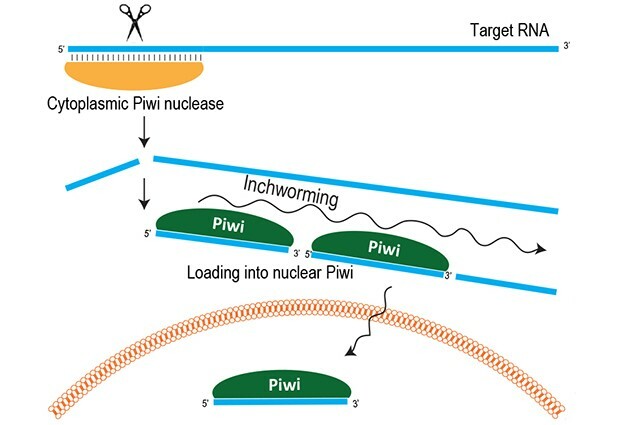 The new piRNAs were then loaded onto a PIWI protein that was able to travel to the cell nucleus, where the piRNAs could recognise the jumping gene within the DNA, enabling the PIWI protein to silence it.